– Stone: Stone, Ice 1507, Pewter. N.B. : Because it is handcrafted, the overall size of the rug can vary by approximately 3 cm, even on custom-sized rugs. 100% cashmere throw. Titanium color. Edging in Nubuk leather color Saddle-hide. fabric on the other (73% wool / 27% cotton) (see textile collection Art. 24). The bedspread is reversible. Structure: free-standing bed frame in very thick plywood. The bed frame is designed to accommodate pocket springs covered with a layer of high resilience (CFC-free) polyurethane foam. A perforated plywood panel, placed under the springs, facilitates the circulation of air. Headboard in curved plywood, padded with high resilience, variable density polyurethane foam and grafted to the bed frame, for easy bed assembly. All of the padded parts are covered in heat-bonded fiber laminated to white cotton fabric that lends a soft fluffiness to the padding while separating it from the fabric, ensuring the product is both natural and hygienic. The upper part of the bed frame is covered with an additional perforated fabric covering that allows greater circulation of air in the spring structure. Base: weight-bearing in extruded aluminum (exclusive design by Minotti Studio) with extra-glossy anti-fingerprint Pewter color finish. Protective black- painted SEBS glide (soft scratchproof rubber). – 30 mm MDF, contoured, Sand, Granite or Mud color glossy lacquer finish. The 280×140 cm. 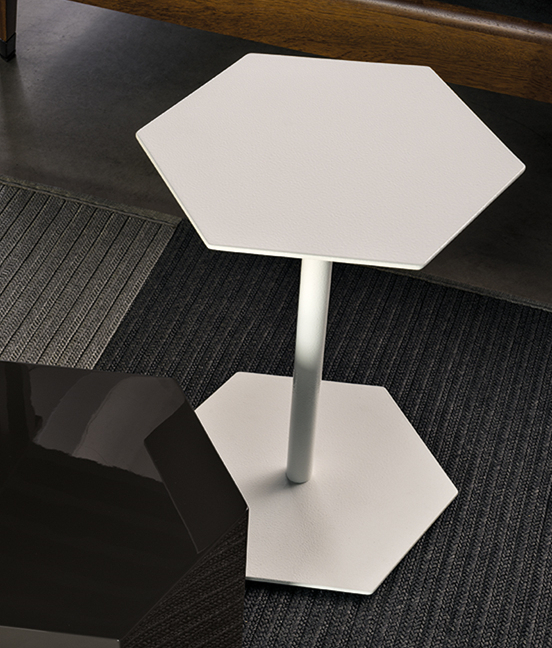 table top is held by a weight-bearing aluminum structure with a glossy Light Bronze painted finish. spacer recommended for use on rugs. – 30 mm MDF, contoured, Sand, Granite or Mud color glossy lacquer finish. The base comes with rubber pads for use on floors. Also included is a 10 mmH spacer recommended for use on rugs. Base: Ø 100 mm metal tube, painted in glossy Pewter with extra-glossy anti-fingerprint finish and upper and lower plates with the same finish. – 20 mm Bardiglio Nuvolato marble, contoured. The base comes with 5 mm H foot pads in DELRIN® (heavy-duty plastic material)for use directly on floor. Also included are 15mm H replacement foot pads recommended for use on rugs. Base: 80 mm Ø metal tube, with glossy light Bronze painted anti-fingerprint finish and upper and lower plates with the same finish. Shelves: in 50 mm reinforced MDF sandwich, glossy Warm Grey finish. Back panels: in 55 mm MDF sandwich, Sucupira veneer with stained Mink finish. Vertical metal supports: with Bronze satin painted finish.The bookcase has adjustable feet and is delivered for assembly. Finishes: 10 mm satin-finish metal sides, light Bronze painted finish. Outside finish of the drop-down door and drawer front in Sucupira with stained Mink finish. Inside finish of the container with the drop-down drawer in Corten color glossy lacquered finish, inside finish of the drawers in Sucupira with stained Mink finish. The drawers are fitted with a Push and Pull mechanism, the small drawer has a maximum load of 25 kg. and the large drawer has a maximum load of 40 kg. The drop-front door has bronze-finish hinges and steel cable mechanism that slows down the opening of the door and facilitates its return (maximum load of 2kg.). The drop-front door also has a soft close mechanism. The “buffet” has an upper top in 10 mm. extra-clear transparent glass, lying on a structural bar and on two supports with glossy chrome finish (electroplated *). (except for the Gray table size cm 47×80). Protective felt glides. – 20 mm Calacatta marble. Black ribbed rubber protective glide. Drawers: Sucupira with stained Mink finish inside and outside the drawers. Protective felt glides. Structure: in satin-finish metal and light Bronze painted finish. – Sucupira veneer with stained Mink finish. – Satin-finish metal with light Bronze painted finish. Rests on protective ribbed rubber glides. Structure: satin-finish metal with light Bronze painted finish. Top: satin-finish metal with light Bronze painted finish. Rests on protective ribbed rubber glides. N.B. : protective glossy transparent paint for the 25×25 cm and 30 cm Ø tables. Structure: glossy chrome-plated metal structure (electroplated*). The B model structure is made of no. 6 rods Ø 8 mm. Protective felt glides. * Electroplating is an industrial process that is used to obtain a surface finish in chrome, and to provide resistance to rust and corrosion and a certain degree of hardness. – 2 mm Lati veneer with stained brushed Wenge finish. Base: in MDF, 65 mm high, painted matt black, adjustable. Protective Hytrel® (soft, scratchproof rubber) slides. – 12 mm Sand, Teal or Granite backpainted glass. Finish only for Ø 120 cm table. All tops are supported by a structural panel in laminated MDF and with matt black finish. Legs: solid brushed oak, with Black finish and upper and lower plate in satin-finish metal with light Bronze painted finish. Protective felt glides. – 20 mm MDF, Sucupira veneer with stained Mink finish. The tops is supported by a structural panel in laminated MDF and with matt black finish. Structure: external structure in 3 mm. satin-finish metal, with light Bronze painted finish and bonded to an internal 6 mm. MDF structure, with Sucupira veneer with stained Mink finish. Central separating panel in MDF with Sucupira veneer with stained Mink finish. Base: in MDF, 65 mm high, painted matt black, adjustable. N.B. : the table is delivered with a cm 3 H spacer, to be used when the product is combined with Freeman and Freeman Lounge sofas with feet height 10,5 cm. Covers: tufting does not allow the fabric or leather cover to be removed. Base: structural polyurethane (Baydur® 60) mold, semi-glossy dark Moka finish. Protective Hytrel® (soft scratchproof rubber) glide. Structure: in 33 mm. thick solid, kiln-dried iroko wood. Worked on a numerically controlled machine, finger joints. Jointed and finished by hand. The structure is available in a natural or “Dark Brown” stained finish. Both structures are treated with a high UV- and weather-resistant paint with a 35 level gloss finish. Painted metal underframe for the seat for outdoor use with elastic strap webbing in UV-resistant synthetic rubber and polypropylene. In order to protect the lower part of the seat cushion, an expanded polyurethane mattress with a non-slip waterproof coated fabric is provided. Mattress cover removable through a zipper. Cushions: channeled goose down padding for the backrest and seat cushions (Assopiuma certified, Gold Label) with high resilience, variable-density polyurethane foam core insert. Covers: cushion covers are completely removable in all the versions (fabric and leather). 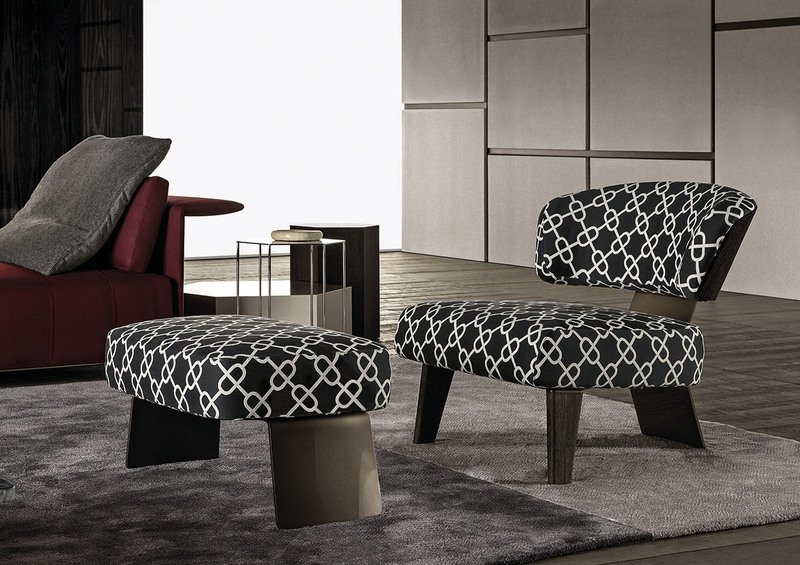 Legs: rest on aluminum tips inserted in the solid wood with Pewter painted finish and protective rubber glide. Top: 20 mm. Bardiglio Nuvolato marble top, flush-set. N.B. : since iroko wood is a natural material, the veins or shades of color may not be perfectly the same; this should not be considered a defect in the material but rather a quality of solid wood. The color of iroko wood may also change with time. Structure: metal seat coated in fireproof polyurethane foam with suspension provided by high-rubber-content elastic webbing. Backrest in structural polyurethane (Baydur® 60), coated in flexible fireproof polyurethane foam. Backrest and seat casing in breathable heat-bonded fireproof fiber. Covers: fabric or leather covers can be removed by removing the wood frame. 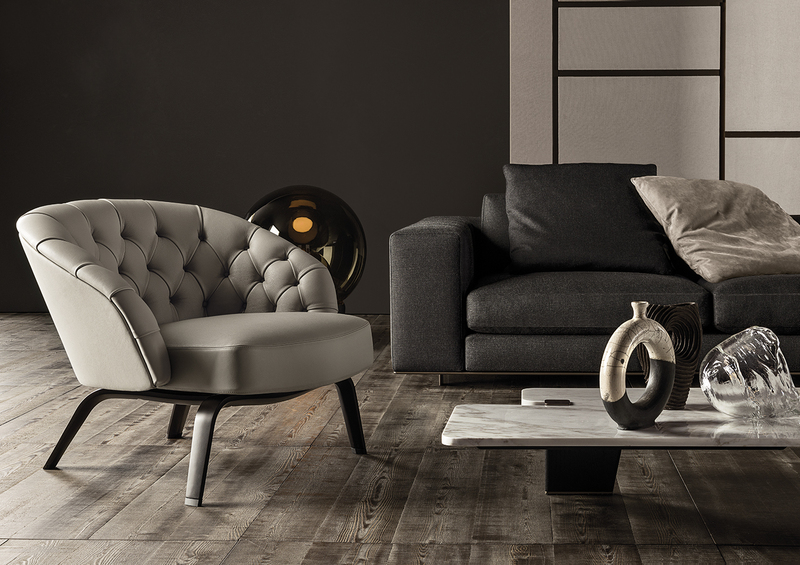 Legs: solid ashwood with open pore Moka lacquered finish or solid Sucupira wood with stained Mink finish. Protective felt glides. Structure: metal seat coated in fireproof polyurethane foam with suspension provided by high-rubber-content elastic webbing. Backrest in structural polyurethane (BAYDUR® 60), coated in flexible fireproof polyurethane foam. Backrest of the “Wood” armchair is in curved, veneered Sucupira plywood with stained Mink finish laminated to a structural polyurethane. Backrest and seat casing in breathable heat-bonded fireproof fiber. Covers: fabric or leather covers can be removed by removing the metal frame. The “Wood” armchair backrest cover can not be removed. Legs: solid Sucupira front legs with stained Mink finish and with upper and lower metal plates in light Bronze painted finish. Back support in press- formed metal with a glossy light Bronze painted finish. The “Small” armchair swivel base has 70×10 mm metal crosspieces with glossy light Bronze painted finish and adjustable rubber feet. The base has a 360° swivel movement with return. Protective bronze-painted SEBS glide (soft scratchproof rubber). Structure: in metal coated in fireproof polyurethane foam. Backrest and seat are foamed separately and use polyurethane of different densities for enhanced comfort and softness in the seating area. Backrest of the semi-curved sofa is in structural polyurethane (BAYDUR® 60), coated in flexible fireproof polyurethane foam. Seat suspension provided by high-rubber-content elastic webbing. Backrest and seat casing in breathable heat-bonded fireproof fiber. Cushions: optional cushions in channeled goose down padding (Assopiuma certified, Gold Label). Covers: fabric or leather covers can be removed by removing the metal frame. painted finish. Protective bronze-painted SEBS glide (soft scratchproof rubber). Structure: in MDF with miter folding, available in the following finishes:- Sand, Corten, Petroleum or Mud color glossy lacquer finish; – Sucupira veneer with stained Mink finish. Protective felt glides. – Ocean: Charcoal, Blue, Silver. 1 cm Iron-colored edging on the longer sides. Reinforcing tape edging under the rug. Top: 20 mm Purple Porphyry, fine grain brush. Base: in Ø 100 mm metal tube and plate with glossy epoxy Pewter paint for outdoor use. Leveling foot pad in stainless steel with Delrin® protective glide. Top: 115 mm. wide solid iroko wood slats, available in the following finishes:- 25 mm natural iroko wood, contoured; – 25 mm “Dark Brown”-stained iroko wood, contoured; Natural or “Dark Brown”-stained iroko wood is treated with a high UV- and weather-resistant protective paint with a 35 level gloss finish. Top: 115 mm wide solid iroko wood slats, available in the following finishes: – 25 mm natural Iroko wood, contoured; – 25 mm “Dark Brown”-stained iroko wood, contoured; Natural or “Dark Brown”-stained iroko wood is treated with a high UV- and weather-resistant protective paint with a 35 level gloss finish. Base: in Ø 100 mm metal tube and plate with glossy epoxy Pewter paint for outdoor use. Leveling foot pad in stainless steel with Delrin® protective glide. Structure: metal, epoxy paint for outdoor use with bush-hammered finish, White color. Protective glides in black ribbed rubber. Structure: in Forex, a plastic material made of PVC foam or semi-foam, using miter folding. Available in a Sand or Granite color glossy finish. Protective glides in ribbed black rubber. Structure: in 33 mm thick solid, kiln-dried iroko wood. Worked on a numerically controlled machine, finger joints. Jointed and finished by hand. The structure is available in a natural or “Dark Brown” stained finish. Both structures are treated with a high UV- and weather-resistant paint with a 35 level gloss finish. Painted metal underframe for the seat for outdoor use with elastic strap webbing in UV-resistant synthetic rubber and polypropylene. In order to protect the lower part of the seat cushion, an expanded polyurethane mattress with a non-slip waterproof coated fabric is provided. Mattress cover removable through a zipper. Cushions: seat and backrest cushion in high resilience polyurethane foam and eco-compatible waterproof fiber. In order to better protect the padding from water and humidity, all the cushions have a waterproof polyester cover. All the accessories – hinges, yarn – are waterproof and therefore suitable for outdoor use. Covers: completely removable cushion covers. Top: 20 mm Corian® EC Elegant Grey colored top, flush-set. colors: Bamboo, Stone and Moka. Base: 33 mm wood base in solid kiln-dried Iroko wood. Worked on a numerically controlled machine, jointed and finished by hand. The structure is available in a natural or “Dark Brown” stained finish. Both structures are treated with a high UV- and weather-resistant protective paint with a 35 level gloss finish. Underframe in metal painted for outdoor use. Woven elastic webbing for outdoor use in UV-resistant synthetic rubber and polypropylene. In order to protect the lower part of the seat cushion, an expanded polyurethane mattress with a non-slip waterproof coated fabric is provided. Mattress cover removable through a zipper. Structure: in plywood with suspension provided by high-rubber-content elastic webbing. The seat structure is made of several layers of variable-density, high resilience polyurethane foam. The upper layer is made of single high-elastic-content contoured straps which, combined with the lower layer, guarantee enhanced softness over time. “Wing” armrest in metal coated in fireproof polyurethane foam. The entire structure has a breathable heat-bonded quilted fiber casing laminated to a white hypoallergenic cotton fabric which lends softness. A special assembly was used for the structure covering (backrest and seat). The various parts in fabric were joined by using a bronze-colored strip of eco-leather with double-stitched detail. In the leather version, the strip is in the same leather as the one used for the upholstery. Cushions: channeled goose down padding for the optional backrest cushions (Assopiuma certified, gold label) with Memory Foam core insert (temperature-sensitive material). Covers: seat and backrest cushion covers are completely removable in all versions (fabric and leather). The “Wing” element cover is removable only for the fabric version. The fabric structure covers come off by removing the metal base after loosening the ribbed handles with the key that is provided. Structural leather upholstery is not removable. 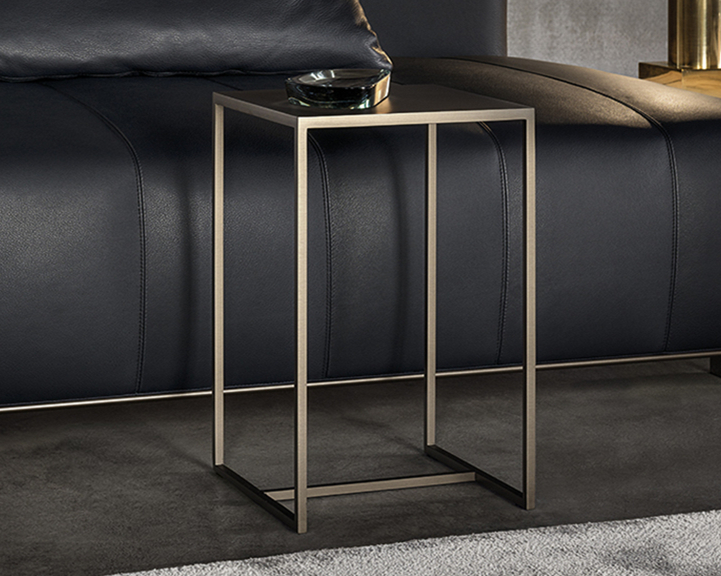 Base: extruded aluminum frame with cast aluminum joint fittings (both an exclusive design by Minotti Studio), with a glossy anti fingerprint light Bronze painted finish. The metal feet also have a glossy light Bronze painted finish. Protective bronze-painted SEBS glide (soft scratchproof rubber). N.B. : to facilitate transport and removal of covers, the armrests and backrests can be removed from the base by means of a quick coupling and uncoupling system. Structure: in plywood with suspension provided by high-rubber-content elastic webbing. The seat structure is made of several layers of variable-density, high resilience polyurethane foam. The upper layer is made of single high-elastic-content contoured straps which, combined with the lower layer, guarantee enhanced softness over time. “Wing” and “Mix” have an armrest and/or backrest made of a metal frame coated in fireproof polyurethane foam. The entire structure has a breathable heat-bonded quilted fiber casing laminated to a white hypoallergenic cotton fabric which lends softness. A special assembly was used for the structure covering (backrest and armrests). The various parts in fabric were joined by using a bronze-colored strip of eco-leather with double-stitched detail. Cushions: channeled goose down padding for the backrest cushions (Assopiuma certified, gold label) with Memory Foam core insert (temperature- sensitive material). Covers: backrest cushion covers are completely removable in all the versions (fabric and leather). The “Wing” element cover is removable only for the fabric version. The fabric or leather removable covers of the structure come off by removing the metal base after loosening the ribbed handles with the key that is provided. 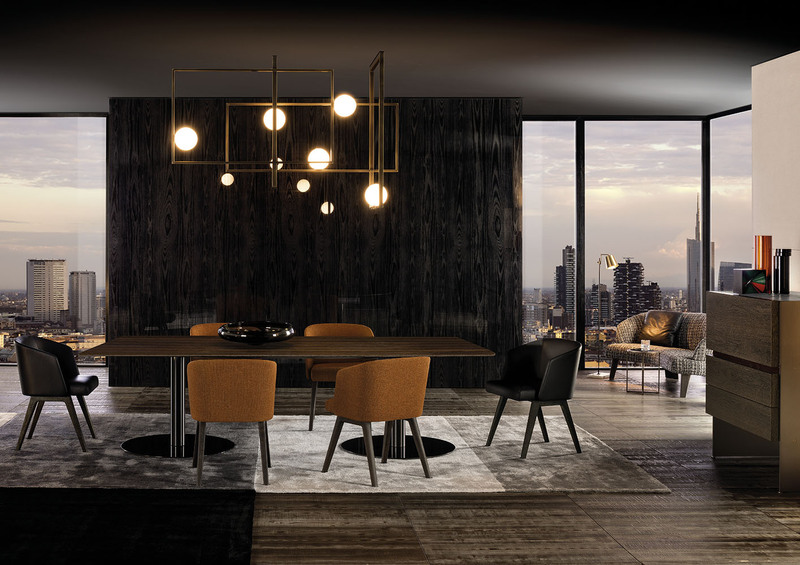 Base: extruded aluminum frame with cast aluminum joint fittings (both an exclusive design by Minotti Studio), with a glossy anti-fingerprint Light Bronze painted finish. The metal feet also have a glossy Light Bronze painted finish. Protective bronze-painted SEBS glide (soft scratchproof rubber). N.B. : To facilitate transport and removal of covers, the armrests and backrest can be removed from the base by means of a quick coupling and uncoupling system. Structure: in plywood with suspension provided by high-rubber-content elastic webbing. The seat structure is made of high resilience, variable-density polyurethane foam, with a concave contour to cradle the seat cushion in order to maintain its stability and durability. The armrests and backrest have a breathable heat-bonded quilted fiber casing laminated to a white hypoallergenic cotton fabric which lends softness and comfort. A special assembly was used for the structure covering (backrest and armrests). The various parts in fabric were joined by using a bronze-colored strip of eco-leather with double-stitched detail. Cushions:channeled goose down padding for the backrest cushions (Assopiuma certified, gold label) with Memory Foam core insert (temperature-sensitive material). Seat cushions are completely reversible, with channeled goose down padding (Assopiuma certified, gold label) and core insert made of high resilience, variable-density polyurethane foam wrapped in a layer of Memory Foam. Covers: seat and backrest cushion covers are completely removable in all versions (fabric and leather). The fabric structure covers come off by removing the metal base after loosening the ribbed handles with the key that is provided. Structural leather upholstery is not removable. – 20 mm Calacatta marble. Black ribbed rubber protective glide. Covers: tufting does not allow the fabricor leather cover to be removed. 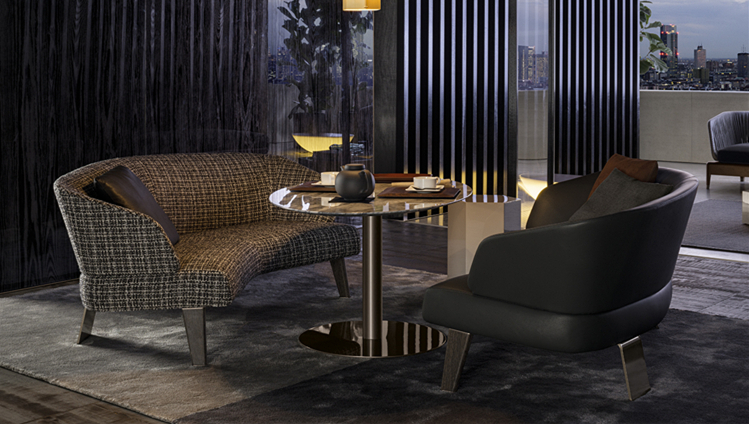 Table tops in uncommon shapes rest on solid brushed oak legs with painted black finish. The bronzed metal cap that rests on the floor and the plate with the same finish located at the upper end of the leg are details that odd a touch of refinement to accessories with an already bold personality. The many finishes available for the table top reflect the enchantment of different materials: from the natural effect of sucupira veneer with stained mink finish, to the more sophisticated calacatta or bardiglio nuvolato marble, to the modern sheen of the glossy lacquered sand or mud finish. The table with round top comes in sucupira veneer with stained mink finish and in backpainted glass in the following colors: teal, granite and sand. In addition to accent tables, the Jacob family also includes a writing desk with the top in sand or mud glossy lacquer finish, or in sucupipa veneer with stained mink finish. The writing desk also has a convenient chest-of-drawers in wood with matt black lacquer finish. Structure: free-standing bed frame in very thick plywood. The bed frame is designed to accommodate pocket springs covered with a layer of high resilience (CFC-free) polyurethane foam. A perforated plywood panel, placed under the springs, facilitates the circulation of air. Headboard in curved plywood, padded with high resilience, variable density polyurethane foam and grafted to the bed frame, for easy bed assembly. All of the padded parts are covered in heat-bonded fiber laminated to white cotton fabric that lends a soft fluffiness to the padding while separating it from the fabric, ensuring the product is both natural and hygienic. The upper part of the bed frame is covered with an additional perforated fabric covering that allows greater circulation of air in the spring structure. Cover: completely removable in fabricor leather. To facilitate cover removal, the headboard can be lifted out of the bed frame by means of a quick coupling and uncoupling system. 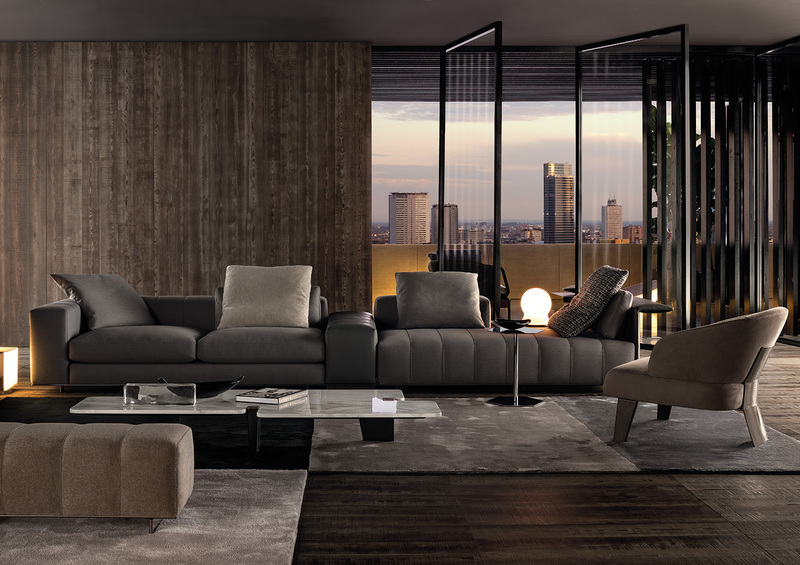 Base: weight-bearing in extruded aluminum (exclusive design by Minotti Studio) with extra-glossy anti-fingerprint Pewter color finish. Legs: solid Sucupira front legs with stained Mink finish and with upper and lower metal plates in light Bronze painted finish. Back supports in press-formed metal with a glossy light Bronze painted finish. Protective bronze-painted SEBS glide(soft scratchproof rubber). Structure: metal backrests and armrests, subjected to three phases of preparation: sand blasting, zinc primer for outdoor use (facilitates and improves adhesion of the finish paint) with polyester powder coat for outdoor use in Pewter color glossy finish. The metal structure is covered in a Taslan* braided polypropylene fiber that forms a 24×7 mm strip. 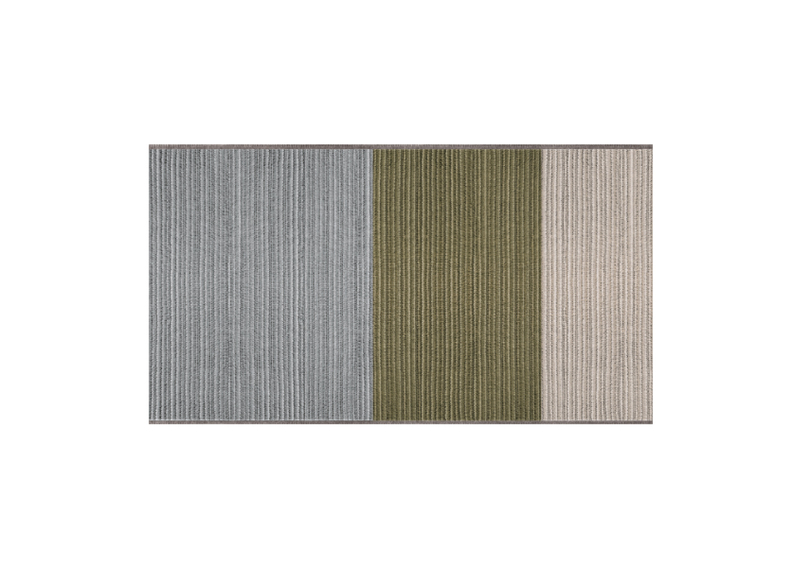 The fiber is available in the following colors: Bamboo, Stone and Moka. Cushions: seat and backrest cushion in high resilience polyurethane foam and eco-compatible waterproof fiber. In order to better protect the padding from water and humidity, all the cushions have a waterproof polyester cover. All the accessories – hinges, yarn – are waterproof and therefore suitable for outdoor use. Covers: completely removable cushion covers. Freeman embodies this dual identity: the Freeman “Duvet” elements feature smooth, enveloping lines and extra-soft cushions that, like a warm embrace, induce a feeling of pure relaxation. The Freeman “Tailor” elements express a different personality, with their more defined shapes and one-piece seats enhanced with top-stitching that accents their graphic nature and contemporary spirit. The wedding of these two spirits makes it possible to create compositions, with a dynamic air that characterize different moments in the day and different ways of using the sofa. Seat cushions: Extra-soft seat cushions with polyurethane core insert, wrapped in memory foam padding and topped with a layer of soft down. Stitching: Backrest, seats and armrests feature a unique stitching detail – the various parts of the fabric are joined by a strip of eco-leather finished with a double-stitched motif. Seat cushions: One-piece seat features original decorative stitching. The Freeman “Tailor” elements provide a charming alternative with “Wing” backrests and armrests, both featuring clean, light lines thanks to a polyurethane foam-covered structure, in clear contrast to the considerable volume of the seats. The use of “Wing” backrests and armrests adds visual lightness to the compositions created with the “Tailor” elements, making them more dynamic. 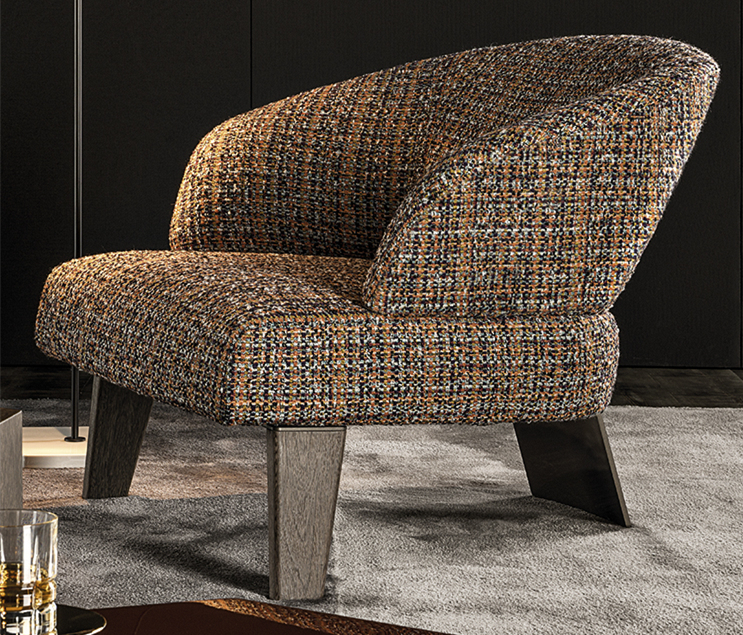 The Freeman seating system has a wealth of couture content that strongly reflects the unique expertise the company has acquired over the years. Notably, the structures of the Freeman elements reveal a complex and sophisticated construction – the various parts in fabric are joined using a bronze color strip of eco-leather with double-stitched detail, which lends the fabric a very original look. The same type of workmanship also characterizes the backrest cushions.